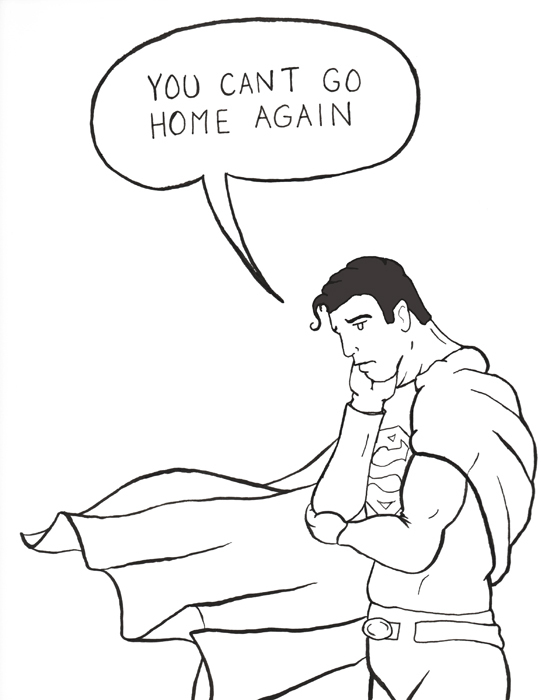 Is anyone else excited to see the new Superman movie, Man of Steel, this weekend? Perhaps I should’ve waited until after seeing Zack Snyder, Christopher Nolan, and David Goyer’s Superman film before I posted this, because maybe Superman might have something else to be sad about, but I couldn’t wait to nerd out about one of my favorite superheroes. People tend to not like Superman. Most people complain that he is too powerful and that he’s not relatable. He is unlike anyone else on Earth, doesn’t fit in with society, and has a tormenting secret inside of him. He sounds like most high schoolers, especially the comic book readers and other nerdy folk. He also doesn’t have a feeling of home or know what it is to be with his own kind. So why do people not find him relatable? I guess it is because at the end of the day he is super powerful, good looking, and has a love interest that pines for him. In short, the nerdy kid never wants to read about the jock who only pretends to be the dorky Clark Kent. I understand people’s dislike, however the fact that he is not like me is fascinating. With all that said, I hope I am not disappointed tomorrow. This entry was posted in Uncategorized and tagged MAn of Steel, sadsadsad, superman, superman hate, zack snyder. Bookmark the permalink. Well Josh, it has had HORRIBLE reviews. The story is dead air, then tons of meaningless action, then dead air, and no character development.